Every Hindu knows the story of Daksha Yajna. The story nor only adorns a tale but points a moral. Whilst it depicts an example of divine chastity in a story full of great pathos on the one hand, it delineates furious revenge, terrible wrath, and the mighty power of providence on the other. Prakriti or Shakti, the primordial female element of creation is wedded to Purusha or Mahadev-the god of gods, the primordial male element of creation. Mahadev despises society, roams about the universe in supreme indifference to everything and every body about him. His hair is matted and wet with water of the Ganges whom he bodily carries in it. He has a tiger skin for his loin cloth and venomous snakes for the decoration of his matted hair. His entire body is covered with dust and ashes. Though the all-powerful lord of creation, he supremely indifferent to wealth, vanity, and show and therefore omits to adorn and decorate his spouse, the most beautiful of the beautiful daughters of the world. Now emperor Daksha, husband of Sati s mother wishing to subjugate the whole earth performs a Yajna ( sacrificial festive ceremony ) to which he invites all the gods except Mahadev and his spouse. Incensed with this insult, Sati comes voluntarily and uninvited to her mother and asks for an explanation. Daksha allude to Mahadev in the most slighting terms as a naked, homeless, poverty stricken, unclean vagabond, who is unfit for invitation to any respectable household and much more so to a royal ceremonial feast. Sati whose spotless chastity, matchless love and devotion to her husband had won for her the highest esteem of all the gods, was mortally wounded at this cruel public humiliation of her lord. So much so indeed, that she causes her soul to leave her body. On coming to know of this sad occurrence Mahadev becomes mad with fury. He vows vengeance and descends upon the scene of Daksha s festivities with the whole of his retinue of ghosts, goblins and demons, picks up the corpse of Sati and placing it upon his shoulders, dances madly about, threatening destruction to the universe. Mahadev s followers in the most cruel and wanton fashion spoil and pollute, the whole of Daksha s sacred offerings, put out the sacrificial fire and make a terrible mess of the whole show at which the gods and invited guests flee pell-mell for very life. Panic stricken and breathless, the gods seek the protection of Brahma the creator, who has however in his turn to crave the help of Vishnu the preserver, for saving the creation from the wrath of Mahadev the god of destruction. There was nothing in heaven or earth except Vishnu s Sudarshana Chakra ( probably the most powerful revolving weapon system ever known ) that could accomplish this. So Vishnu runs hastily down to Daksha s palace and blows away Sati s body into fifty one fragments. So terrible is the power of the weapon that the fragments were blown from Khankhal, capital of Daksha s Empire to the remotest parts of India. The place where each fragment falls becomes from that moment a sanctified spot. 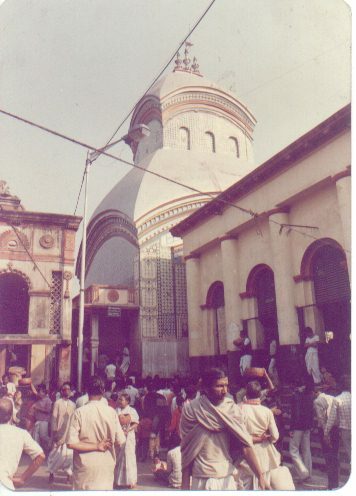 A part of the Sati s right foot falls at a spot close to the place where the temple of goddess Kali of Kalighat stands. The legend of the discovery of Sati s right foot in a petrified condition at the spot in which it fell has been handed down from generation to generation. And it is also connected with the birth of Laksmikanta. One of the most auspicious days in the Hindu almanac is the Laksmipurnima day of the month of Aswin. It was at 4.15 PM of this day in the year 1570 that Laksmikanta was born. He derived his name from the day of his birth and very high honour, wealth and prestige was predicted of him. Jiya Ganguly as a man of wealth and position was petted and pampered in his young days. He was married at an early age according to the prevailing custom of his time. His wife Padmabati, renowned alike for her beauty and charity, disappointed her relatives in that no child was born to her even though she was nineteen years of age. So they prevailed upon her to accompany her husband to Kalighat, and there prostrate herself before the family deity, the goddess Kali, in penance and prayer for three days and three nights and invoke her blessing for the birth of a son. In the night of the third day she saw a halo of light on the surface of the tank, east of the temple, and drew her husband s attention to it. She told him that she had dreamt that she would become the mother of a son, if she bathed in the tank. Next day when she went to bathe there, she saw the right arm of Sati above the surface of the water and heard a voice to say that the sebayets of the goddess would recover the relic of the right foot of Sati at the bottom of the tank. The relic-petrified right foot of Sati - was according to the legend really discovered at that spot indicated by her to the then sebayet Atmaram. 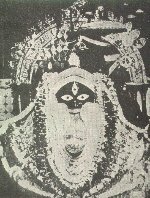 It is said that the relic is still being preserved by the present sebayets within an iron safe in a room of Kali s temple. Padmabati gave birth to Laksmikanta within a year of this incident and the tank was regarded thenceforward to be sacred tank, a dip in which made a barren woman fruitful. So great is human credulity that even to this day hundreds of barren women flock to this tank year in and year out to get a blessing of goddess Kali. The family Deity of the Sabarna Roy Choudhury Family. This temple was built in the year 1809. Famous zamindar of his times and a social reformist Santosh Roy Choudhury started building the temple but soon after in 1799, he died. His dreams was fulfilled by his grandson Rajiblochan Roy Choudhury.